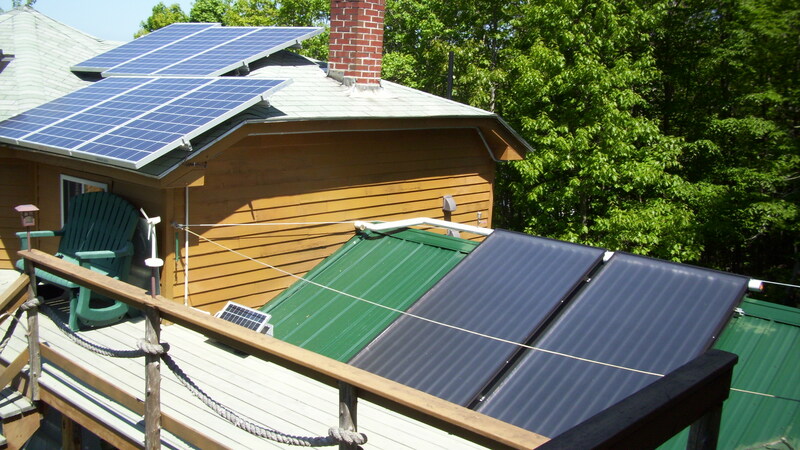 Living in a wicked efficient, solar home can be very cool. The last 1.0 kW of PV was added in 2013 to take advantage of a regional "Non-Transmission Alternative Pilot Program, that created an additional $40/month cashflow for 36 months, improving the return on the investment and bringing the property to Net-zero electricity. 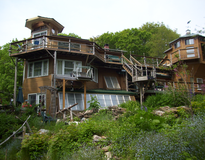 Grid Tied PV Cedar-sided contemporary built with local (Maine grown) cyprus and lots of drift wood. Three levels of decks with great elevated ocean views of Boothbay Harbor. 2,0 W PV system & solar powered hot water system, attached green house with 1000 gallon thermal storage pond,efficient lighting, condensing boiler, radiant heated floor, passive heating, daylighting and efficient appliances. Working engineering & sales office, as well as home to 6 with ~$10/month electric bills. 4 bedroom home with office, and large kitchen, living room and attached greenhouse located on Campbell Street on the East side of Boothbay Harbor. The house is a very warm, healthy and sunny place to be. 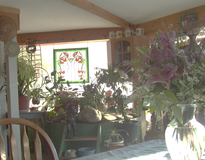 We start plants early in the spring and have a great green and growing place throughout the winter. 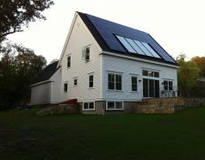 This home serves as our working sales tool for renewable energy systems and efficient technologies. 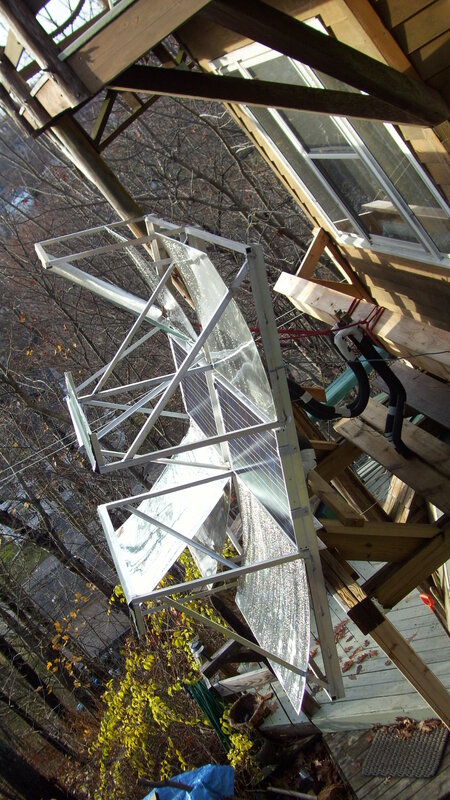 The SHW system requires matenance, flushing out the heat transfer fluid every 4-5 years and the solar preheat tank needs its sacrificial anoids replaced every 7-8 years. Occationally, snow is raked off the collectors if there is a large storm. 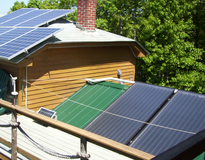 The PV system is practically maintenance-free. I am an environmentalist, enjoy carpentry and have been a solar enthusiast since I was in middle school. My business, Heliotropic Technologies, an energy engineering services and renewable energy business operates out of this location. Needing a showroom for products, these working systems made a lot of sense to have on property. 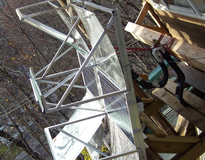 Hire Heliotropic Technologies to develop a strategic energy plan, and then have them install your energy efficient systems. Take Rte 1 North across Wiscasset bridge, Turn onto Rte 26 headed to Boothbay Region. Travel ~10 miles to Boothbay Harbor. Take left onto Union Street and continue on to Atlantic Avenue. Turn left on High (or Bay) Street and then take a left onto Campbell Street. 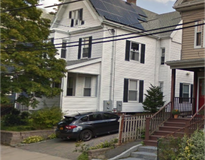 The house has Heliotropic Technologies signs and is located near the Park Street end. This was an existing seasonal cottage that was situated with very good southern exposure and elevated ocean views, that has been retrofitted into a super-efficient cool place. It was not torn-down, but cost-effectively improved and is now a local landmark. Latest tower/dormer addition has R-80 ceiling & R-45 walls insulated with urethane foam and reflective barrior.